A few months back, I covered a Kickstarter looking to fund the first few issues of a four issue series. That project was for A Piggy’s Tale, which met it’s funding goal and is now slated to release in comic stores nationwide this Wednesday, April 16th. 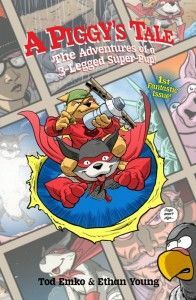 The book is inspired by the real-life Piggy, a three-legged puppy rescued by the book’s author, Tod Emko and features art by Ethan Young (Tails). A Piggy’s Tale is an all-ages story about a super-pup who is joined by a clever and mischievous feline sidekick, Simon (inspired by Piggy’s real-life cat buddy), both seeking to save people from evil in NYC. Consider picking this up to not only support indie comics, but a great cause as well! Want to see more? Click the image below for a 12-page sneak peek at issue #1.